Residential and commercial garage doors from Cal’s Garage Doors are among the most dependable in our industry. Day or night, winter or summer, our garage doors will always be there for you. The reliability of our garage doors will send you on the way in the morning. At the end of a busy workday, their beauty will greet you as you arrive home in the evening. Most importantly, the security of our garage doors will ensure that your family is safe as they rest at night. However, you don’t have to take our word for it. 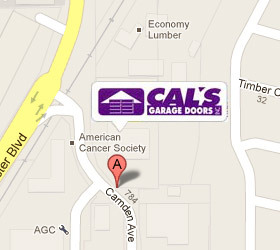 Read on to see just what Cal’s Garage Doors have done for others! Had a tension spring break on our garage door.I called Cal's and they were able to have someone come out within 30 minutes. Rico was friendly and courteous. He had the springs replaced within 20 minutes. Ended up having both springs replaced because it was more cost effective. Great Price! Great Customer Service! Great Employees! Great Company! I had Cal's replace my garage door springs last month. I went through my home warranty, so cannot judge on the value aspect. The guy who came over was on time, worked efficiently and was pleasant to deal with. I would definitely give them any future work. Cal's Garage is one of the best company to have worked with. I must have called Dave 20 times with multiple questions. I was very indecisive during the whole process since I have never shopped for a garage door before. But no matter how many times I changed my mind on the style or how many questions I asked, Dave patiently answered them all with a positive attitude! Dave ordered the exact door I wanted and had 2 awesome guys installed it. Chris (very cute!) did most of the installation, he was friendly (and did I mention cute!) thorough and cleaned up as he worked. The finished product exceeded my expectations! I will definitely call Cal's garage doors back, I will need a garage opener in the near future. We have used Cal's for 22 years and the "new" owners have extended the same good service as the previous owners provided. Chris came out within the 2 hour window on the same day that we called and replaced the rubber strip on the bottom of our door and lubricated and checked everything for a reasonable price. Chris was very pleasant to deal with and it was a pleasure to use this company. We plan to call them for our future needs. We had about 3 quotes for a new garage door last August 2006, and we decided to go with Cal's Garage Doors. It was a smaller company, and seemed to be more personal. And, the price was in line, and maybe slightly "less" than the others (can't quite recall). Then, a few days later I left a message on their answering machine in the evening, and by the next morning they called back. By noon that same day... someone was over to fix the door at no charge. (It was just a pin above the door that had come loose / or out). Quick, reliable, friendly service! 🙂 If we were to move, and needed a garage door again... we would definitely use this company again. Cal's to the rescue - again! A few days ago, as I was hobbling on my broken foot out to my mom's car (okay, yes, my last review for Cal's, I had a busted knee... I'm clumsy), I closed the garage door and the bracket snapped! Argh. I don't know who originally installed the door (it was here when we moved in), but as far as I can tell, they did a terrible job. First, the spring broke, then the rails were not correct and one ended up breaking, then the opener died, and now the bracket and one of the hinges was broken! Cal's replaced the rails and opener, and when the logic board went haywire, they replaced that too! Finally, this morning (a week later), I got around to calling them. Dave answered, as usual, and was his usual helpful self. He even asked about my "phantom opener" that they fixed last time. I expected to have to wait at least a day for my appointment, but he said "I can have someone over there later this morning." I said "great!" He told me "11-1," but I wasn't sure if my son would be up from his nap, so I asked if we could make it a little later: "no problem! How about Noon?" Great! Rob showed up almost exactly at 12:00. The guys from Cal's - granted, I've only worked with Rob (2x now) and Rico over the last 4 years, have always pretty much arrived at the beginning of the time bracket. You can read my previous review for details. Rob was able to fix the broken hinge (the ones on the door were nylon, not metal) and the bracket in about 15 minutes, and he asked if I wanted to replace the other hinges for a nominal fee (the cost of the parts, which was less than $10 each), I figured what the heck, peace of mind for less than $50? Sure! So he replaced those, and was outta here by 12:30, even having a couple of minutes to chit-chat about my screaming high-maintenance baby (yup, the one I was preggo with last time they came out). Thanks Dave & Rob! You guys are awesome! Have used Cal's twice now for two of my rental properties, and am nothing short of pleased with their service. Each time they were able to go out day of my phone call, and get the issue repaired or communicate with me what was needed, and provide several price quotes. I will continue to utilize their services, as well as refer my clients to them as well. We had our electric garage door for almost 4 years. Recently, every time we closed it, it would start to close and then reopen, so we needed to get it repaired. There was a small tear at the top of the door, which we thought might be the problem. There was a sticker inside the garage door with the name of the company that installed it. I had them come out and check the door. The repairman stated it would cost $300 to replace the top panel of the door, or $90 to repair it. I decided to call 2 other companies for estimates; good thing. The second company said the tear was probably caused because the installer wound the springs too tightly. It's funny that the installer never mentioned the springs being wound too tightly. This tension caused the top of the door to tear. It would cost $300 to replace the top panel of the garage door. The third company, Cal's Garage Doors, said the same thing, but the repairman took it a step further. He loosened the springs at no charge. It only took a couple minutes. Now the garage door closes. The tear will continue to get bigger, but at a slower rate. We will still need the top panel replaced eventually, but loosening the springs will prevent the door from tearing in the future. When we finally need the top panel replaced, we will call Cal's. This company is honest and won't rip us off! I had Cal's Garage Doors install my original door when I first bought my home about 9 years ago. It was a very economical and pleasant experience. In my remodel a couple of years ago, of course I chose Cal's again, and just like the first time, they had the best price and excellent service without a single glitch. Over the years as minor issues have cropped up, they have either helped me solve them over the phone at no charge, or they have come over and handled the issue promptly and efficiently, for a very reasonable fee. They are always punctual and very helpful. Today we had an issue with the door opening immediately once it had closed, and in a brief phone conversation they gave my son some troubleshooting advice which enabled him to fix it himself. I will definitely call Cal's again for any future garage door needs, and I always highly recommend them to family and friends. The spring on our garage door broke, so we looked online for reviews of area companies. Cal's got good reviews, and he was nearby, so we called him. He was friendly and sent someone out in about an hour. The job was done quickly and well at a reasonable price, and we are very happy. 2 years ago we bought a garage door from Cal's and did not install a new opener since ours was fairly new. We were having problems with the opener and they were at my house within an hour of my calling. After a bit of troubleshooting they were able to fix the opener and they even fixed some other things. I'd highly recommend them. They were competent, courteous, and competitive in their pricing. At Cal’s Garage Doors, we are proud to have served thousands of satisfied clients all throughout the Santa Clara Valley, San Jose, the Bay Area, and beyond. We would love to make you a member of our family. Contact us today at (408) 379-5001 to see just what our garage doors can do for you. Your initial consultation and estimate is 100% free. We look forward to hearing from you.